Though the impact and $125 billion in damages that Harvey caused were catastrophic, some of the investments and decisions made in Texas well before the storm allowed for faster restoration of power than would have been the case just a few years prior. Plus, renewable energy resources like wind turbines and solar panels can play a role in strengthening grid resilience. Investments in modern technologies – like digital controls, microgrids, and distributed energy – hold the keys to protecting people in towns and cities most susceptible to future powerful storms, and they provide insights for how Texas can prepare for the next power disruption. 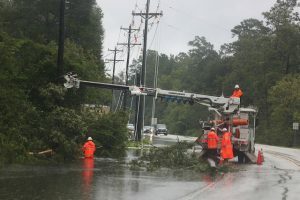 As a result of Texans’ experience with extreme weather, availability of cost-effective technologies that can modernize our electric grid, and strong business cases for customer-sited energy systems, many energy stakeholders have made notable investments in enhancing the resilience of critical electricity services. For example, a new report by CenterPoint Energy, the Houston area’s electric utility, sheds light on how investments in smart sensors, controls, and communications systems allowed the company to improve customer service and reduce the impact of outages. In fact, these systems have led to better power-outage tracking and customer notifications, and the intelligent switches installed across CenterPoint’s grid allowed it to avoid nearly 41 million minutes of customer outages during Harvey. In addition, just about every one of Centerpoint’s customers has a smart meter – which not only enhances the visibility that operators have of the electric grid, but has resulted in 15,000 tons of avoided carbon pollution since 2009. These are the types of smart planning and investments that help build a stronger, cleaner energy system. Texas is a leader in wind energy, and when Harvey hit, some of its renewable energy infrastructure remained intact. Wind turbines are typically built to withstand winds up to 55 miles per hour. Harvey had winds nearly double that speed, yet some equipment was able to continue to generate power and function reliably. However, sometimes the turbines couldn’t provide power because the local electric grid went down and there was nothing for them to connect to. In other areas, the equipment had to be shut down because of extreme wind speeds. Although this doesn’t take into account how other types of electricity generation performed, it highlights important considerations Texas (and other states) should include when planning grid improvements. Another important component of this resilience story is business investment in distributed energy systems. Eighteen H-E-B Grocery Stores were able to keep the lights on using their microgrids – or smaller sections of the broader grid that can incorporate clean energy resources and isolate themselves when needed – which allowed the stores to disconnect from the main grid and produce their own power during the storm. The Texas Medical Center also relied on its own 48MW microgrid system and network of floodgates that protected its facilities from the record rainfall. Nationwide, universities and hospitals are investing in microgrids. Businesses understand that maintaining access to food, medical services, and shelter is critical during powerful storms. For example, Princeton and New York Universities’ microgrids maintained power during 2012’s Superstorm Sandy, which exposed the vulnerability of the energy system – the storm knocked out electricity for 8.5 million customers in 21 states. Despite progress in smart technologies and renewable energy, Texas’ system still struggled when the storm struck. The installed smart technology alone was not able to prevent all outages. Many power substations flooded, and some crews were unable to immediately travel and contain disruptions. On the heels of Harvey and other recent devastating floods, now is the time for Texans to think holistically about energy resilience challenges in the face of climate change. To begin, state agencies should account for the latest in climate science and changes to the floodplain, so communities are aware of the risks to which they are exposed. A better understanding of natural and man-made hazards would allow communities to develop robust, long-range energy plans and strategies for preparing for powerful storms and recovering from them. After Harvey hit, there was a nearly 700 percent traffic spike in traffic in Texas to an article about whether solar panels could withstand hurricanes. One potential pathway to enhance the energy system’s ability to operate or rebound in extreme weather: further decentralization of resources and investment in smart-grid and renewable technologies. For example, distributed solar panels can be helpful in extreme weather – panels are designed to withstand winds up to 140 miles per hour – and benefit from being able to provide power while the grid is offline. Customers are starting to notice: After Harvey hit, there was a nearly 700 percent traffic spike in traffic in Texas to an article about whether solar panels could withstand hurricanes. We’ve already seen the value smart planning and renewables can bring to enhance resilience in one of America’s fastest growing regions. Texans should go further by taking a holistic approach that recognizes the scope of the costs and risks associated with powerful storms and other sources of disruptions, and invest in a broader set of sustainable, cost-effective solutions to help ride out the next storm. This is the fourth in a series of posts evaluating the aftermath of Hurricane Harvey and offering tactics to avoid the worst effects going forward. The first post looked at three things we know for certain, the second on Harvey’s health impact, and the third on floodplains and natural infrastructure. Our next post will wrap up the series. This entry was posted in clean energy, Renewable Energy and tagged Hurricane Harvey. Bookmark the permalink. Both comments and trackbacks are currently closed.